- Xanadu's Maiden Mineral Resource estimate complete for Kharmagtai Copper-Gold Project. o combined open pit using a 0.3% CuEq cut-off within a Whittle derived shell and underground Resource using 0.5% CuEq outside. o contained metal content of 580Mlb Cu and 1.1Moz Au. - This Resource represents the results of exploration over only a small portion of the much larger mineralised Kharmagtai Intrusive Complex ("KIC") which was first identified from surface outcrops and already partly extended under shallow cover using geophysics and drill testing. - Additional drilling is proposed to test other near-surface strike extensions and several high potential targets lying under shallow cover that have the same geophysical response and geometry as existing resources within the KIC. - Multi-rig drilling program now funded and scheduled for re-commencement April 2015 with a strategy of testing the other targets and an increasing in the shallow economic resource inventory in the next 12 months. March 19 -- Xanadu Mines Ltd (ASX: XAM – "Xanadu") is pleased to announce that the Company has achieved a significant milestone completing a maiden Mineral Resource Estimate in accordance with the JORC 2012 Code for the Kharmagtai copper-gold project within 12 months since acquisition. The Kharmagtai project is located within the South Gobi porphyry copper province of Mongolia, approximately 420km southeast of Ulaanbaatar (Figure 1). The project is strategically located 120km north of the giant Oyu Tolgoi porphyry copper-gold operation and 100km west of the Tsagaan Survaga porphyry copper-molybdenum development. 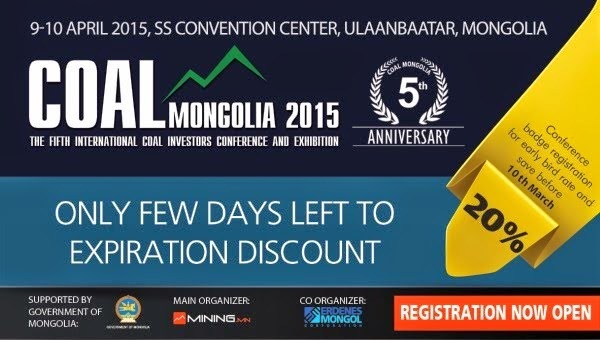 The Kharmagtai project is a joint venture between Xanadu Mines and Mongol Metals LLC. Under the Mongol Metals LLC joint venture terms, Xanadu has the right to earn an 85% interest in the Kharmagtai project, equivalent to a 76.5% effective interest, by funding acquisition and exploration costs. March 18 -- The Board of Xanadu Mines Ltd (ASX: XAM - "Xanadu") is pleased to announce the internal appointments of Mark Wheatley and Dr Andrew Stewart as Executive Chairman and Chief Executive Officer ("CEO"), respectively. These appointments are an important step for Xanadu as the Company focuses on its Mongolian copper-gold strategy and continued exploration success. Mark Wheatley, in the role of Executive Chairman, will guide and oversee the growth of the Company as it continues the exploration and development of its copper-gold projects. Mark has had a successful executive career and has led a number of listed junior miners as both CEO and Chairman through significant periods of growth. The move to an executive role allows more direct access to Mark's experience as Xanadu delivers on its Mongolian copper-gold strategy. Andrew has been promoted to CEO from his current position as Xanadu's Chief Geologist and Country Manager in Mongolia. Andrew is a strong internal candidate as a porphyry copper specialist with a track record of new discoveries and extensive Mongolian experience. Andrew will continue to be based in Mongolia and focus on delivering exploration success and the Company will also benefit from Andrew's contribution to all of its corporate activities. We congratulate Andrew on this promotion. Andrew's profile is included in Appendix 1. George Lloyd fully supports the succession process as he steps down as Managing Director and CEO and will act as an advisor to Mark and Andrew over a brief transition period. Mark Wheatley, Xanadu's Executive Chairman, commented: "This is a natural progression for Andy who has provided excellent leadership in exploration over a number of years and he will thrive with the additional challenges in his new role. Andrew is fully committed to Xanadu's success and I look forward to working with him. I also thank George for his drive and professionalism throughout the restructuring and repositioning of Xanadu and look forward to continuing to work with him during the handover period." Andrew Stewart commented, "I'm very excited by the opportunity to lead Xanadu through its next stage of development. 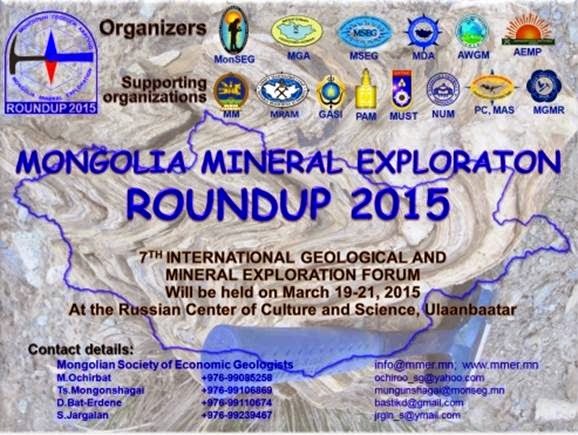 Exploration drilling has commenced at Oyut Ulaan and our multi-rig drilling program at Kharmagtai is well funded. I look forward to working with Mark and the Xanadu team to realise the full potential of our copper and gold projects in Mongolia's highly prospective South Gobi region." The key executive engagement terms are provided in Appendix 2. VANCOUVER, BC--(Marketwired - March 18, 2015) - Turquoise Hill Resources today announced that Oyu Tolgoi has filed a statutory 2015 Oyu Tolgoi Feasibility Study (OTFS 2015) with the Mongolian Minerals Council (MMC). Under Mongolian law, Oyu Tolgoi is required to submit an update to the feasibility study at least every five years; the 2009 Oyu Tolgoi Feasibility Study was accepted in March 2010. When outstanding shareholder matters have been resolved, an updated feasibility study will be submitted to replace OTFS 2015 for acceptance by the MMC. OTFS 2015 is based on the same study as, and is consistent with, the 2014 Oyu Tolgoi Technical Report, which was disclosed by Turquoise Hill in October 2014. However, since the specific commencement date for development of the underground Hugo North block cave is unknown and dependent on resolution of shareholder matters, the OTFS 2015 study reserve case presents the underground without a start date and separate from the open pit. A life of mine case is also presented in OTFS 2015. In this case, a long-dated nominal start date was assumed for underground development. This date was selected only to deal with the uncertainty of commencement and does not reflect an intended underground restart date. Turquoise Hill, Rio Tinto and the Government of Mongolia continue to work together to resolve shareholder matters and finalize project finance in order to restart underground mine development at Oyu Tolgoi. VANCOUVER, BC--(Marketwired - March 17, 2015) - Turquoise Hill Resources will announce its fourth quarter and full year 2014 financial results on Tuesday, March 24, 2015 after markets close in North America. March 18 (news.mn) Rio Tinto Group has prepared and submitted their annual "Taxes Paid" report with detailed information regarding 7.1 billion USD in taxes paid internationally in 2014, with 185 million USD paid to the Government of Mongolia. This is the 5th year the group has published the report. Rio Tinto Group says it voluntarily provides information about taxes of more than 1 million USD that are paid to governments of the countries where they conduct business activity. Last year, the Government of Australia was paid 5.6 billion USD, (6.2 billion AUD), Canada 432 million USD, Chile 262 million USD, USA 211 million USD, Mongolia 185 million USD, France 106 million USD, Guinea 67 million USD, Singapore 44 million USD, and Great Britain was paid 29 million USD. The majority of the totals paid were for taxes and royalty payments. Chris Lynch, Financial Director of Rio Tinto Group noted, "Through our tax and royalty contribution, investments, employment, local purchasing and contracting, we are a major generator of wealth and economic activity. We are very proud of this record. "The taxes paid report is important evidence of our commitment to taxation transparency. We were a founding member of the Extractive Industries Transparency Initiative and strongly advocate the need to appropriately disclose payments to governments around the world." HONG KONG, CHINA--(Marketwired - March 18, 2015) - SouthGobi Resources Ltd. (TSX:SGQ)(HKSE:1878) ("SouthGobi" or the "Company") today announces that to reflect a shift in Turquoise Hill Resources Ltd.'s ("Turquoise Hill") business focus, Mr. Jeffery Dean Tygesen, Chief Executive Officer of Turquoise Hill, resigned as non-executive Director and member of the Nominating and Corporate Governance committee effective March 17, 2015. Mr. Lancaster, Interim Chair, said, "I would like to thank Jeff for his contributions to the Company." 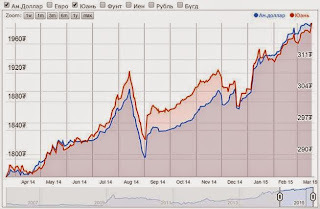 Mogi: how much of is stocks, how much of it is treasuries, now we'll never know. Ulaanbaatar, March 17 (MONTSAME) At the Stock Exchange trades on Tuesday, a total of 19 thousand and 308 units of 26 JSCs were traded costing MNT 515 million 222 thousand and 357.00. "State Department Store" /8,418 units/, "E-trans logistics" /2,916 units/, "Khokh gan" /589 units/, "Material impex" /401 units/ and "Gobi" /273 units/ were the most actively traded in terms of trading volume, in terms of trading value were "Material impex" (MNT six million 156 thousand and 700), "State Department Store" (MNT four million 210 thousand and 200), "Gobi" (MNT two million 017 thousand and 900), "APU" (MNT 925 thousand) and "Tavantolgoi" (MNT441 thousand). The total market capitalization was set at MNT one trillion 359 billion 035 million 503 thousand and 456. The Index of Top-20 JSCs was 13,659.66, increasing 0.14% and the all index of MSE was 980.91, increasing 0.10% against the previous day. Ulaanbaatar, March 18 (MONTSAME) At the Stock Exchange trades on Wednesday, a total of 4,263 units of 16 JSCs were traded costing MNT seven million 849 thousand and 720.40. "State Department Store" /1,284 units/, "Remikon" /820 units/, "E-trans logistics" /750 units/, "Mongolia Development Resource" /496 units/ and "Makh impex" /224 units/ were the most actively traded in terms of trading volume, in terms of trading value were "UB-BUK" (MNT two million 290 thousand and 400), "Darkhan nekhii" (MNT one million 782 thousand and 920), "Gobi" (MNT one million 184 thousand and 170), "Makh impex" (MNT717 thousand and 090) and "State Department Store" (MNT667 thousand and 680). 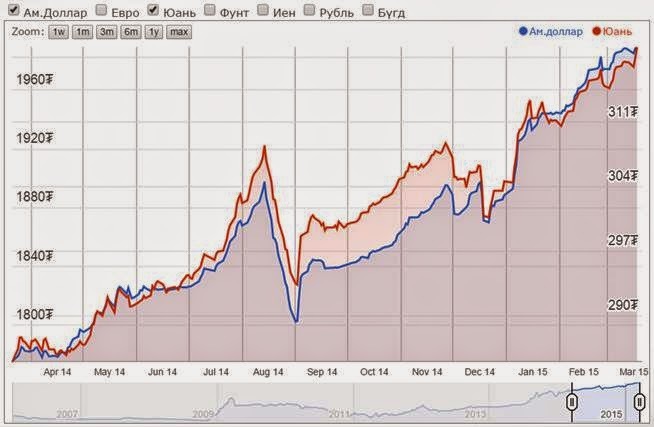 The total market capitalization was set at MNT one trillion 354 billion 207 million 309 thousand and 262. The Index of Top-20 JSCs was 13,520.71, decreasing 1.02% and the all index of MSE was 975.04, decreasing 0.60% against the previous day. March 17 (Bank of Mongolia) On the Foreign Exchange Auction held on March 17th, 2015 the BOM has received bid offers of USD 10.1 million in a rate between MNT 1984.50-1989.61 and CNY 72.5 million in a rate of MNT 317.01-317.61 from local commercial banks. BOM has sold USD 5.0 million in a rate of 1987.11 and CNY 38.5 million with rate of 317.22. On March 17th, 2015, The BOM has received MNT Swap agreement bid offer in equivalent to USD 5.3 and USD Swap agreement bid offer of USD 50.0 million from local commercial banks and accepted the offer. Ulaanbaatar, March 18 (MONTSAME) Sub-groups, set up at the Economic Council to improve business environment and ensure sustainable conditions for the macro economy, held Tuesday a meeting. They discussed ways of selecting their heads, collecting proposals for a draft plan of a programme on measures for overcoming economic difficulties, altering package laws on taxation. Regarding these issues, reports were given by J.Erdenebat, the Minister of Finance; D.Zorigt, the Minister of Energy; D.Erdenebat, the Minister of Industry; D.Tsogtbaatar, the Minister of Construction and Urban Development; and D.Oyunkhorol, the Minister of Environment, Green Development and Tourism. They also shared views with the Council's members. A scrutinized plan is being co-formulated by the government, the Bank of Mongolia (BoM) and the Finance Regulatory Commission (FRC) in a scope of the parliament-approved programme on overcoming the current economic difficulties, this plan is expected to be discussed at a cabinet meeting in near future. Sub-groups responsible for increasing of external trade and foreign investments and for acceleration of the biggest projects on great construction will meet Wednesday. March 16 (UB Post) Bosoo Khukh Mongol NGO and Noyon Uul Movement began a 24-hour sit-in calling for President of Mongolia Ts.Elbegdorj to resign, held at the Statue for Victims of Political Persecution last Saturday, at 6:00 a.m. They are also collecting signatures from people in favor of the President's impeachment. Member of the Board of Directors of Bosoo Khukh Mongol NGO Kh.Beejin stated, "We're calling for the President's impeachment under two points. First, the President didn't keep his promise to the public, and lost our faith. Secondly, his pardon of U.S. citizen Justin Kapla violated the Constitution. Impeachment conditions are consistent with Article 2 of Clause 35 [of the Constitution]. There's no limit for signatures in favor of the President's impeachment. We've received permission for a sit down demonstration." According to the protesters, President Ts.Elbegdorj violated Article 2 of Clauses 35, 49 and 50 in the Constitution of Mongolia by pardoning Justin Kapla, who was found guilty of tax evasion. Therefore, a letter to impeach President Ts.Elbegdorj was submitted to the Constitutional Court on March 12. "We've watched for 25 years. We've had enough. We've been brainwashed. Now, people have even started digging up our sacred mountain. We've suffered enough," P.Shinjeeravdan, Head of Bosoo Khukh Mongol NGO, posted on his Facebook page. After demonstrating and speaking publicly about their opposition to gold mining operations being authorized at Noyon Mountain for nearly two months, the groups identified as nationalists organizations say they put their last hopes on President Ts.Elbegdorj, but the President failed to correspond with them. The groups report that the signatures of over 22,000 people have been submitted to the President. Bosoo Khukh Mongol NGO and Noyon Uul Movement say that they don't need a president who ignores the public's opinion, doesn't wish to protect Noyon Mountain, and commits actions that are different from his words. For these reasons, they're demanding President Ts.Elbegdorj's impeachment. March 19 (Bloomberg) -- Mongolian travel restrictions placed on foreign and domestic workers are hurting the nation's economy, according to its prime minister, who's seeking to change the way the law is applied. The country's "Hotel Mongolia" nickname, acquired as a result of the travel bans, is "poisoning every Mongolian" by harming foreign investment and may affect exchange rates, Saikhanbileg Chimed said Wednesday in a statement on the government's website. The prime minister's comments, which came as he convened a meeting with top officials to discuss the issue, follow a difficult period for foreign investors. Three former employees of Canadian mining company SouthGobi Resources Ltd. -- a U.S. citizen and two Philippine nationals -- were prevented from leaving Mongolia for two years during a criminal investigation. They were convicted of tax evasion in January and spent a month in prison before receiving a presidential pardon. Inbound foreign investment shrank to $507.6 million in 2014 from $4.45 billion in 2012. The period was marked by disputes with foreign investors, including Rio Tinto Group, the U.K. company that runs the giant Oyu Tolgoi copper mine in Mongolia. The prime minister also said his government is working on new tax laws that will bring rules into line with international standards. 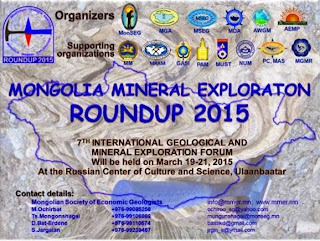 March 18 (gogo.mn) National Council of Mongolian Scientists, Mongolian University of Agriculture and World Mongolia Green Association are conducting Uranium Exploration and Mining-Positive and Negative Impacts International Seminar tomorrow in March 19th at the University of Agriculture, which is to start at 9AM. The seminar will be attended by the researchers, scientists and nature protection specialists from Asia and Europe. The seminar will be addressed by President of Mongolia, Prime Minister, cabinet members, sector specialists, entities working in uranium exploration and extraction, Nuclear Energy Commission and Radiation Agency representatives. March 17 (Bloomberg) -- Ferrostaal Industrial Projects GmbH will begin construction of its Sainshand Wind Farm in April, slated to be Mongolia's largest when it is completed in 2016, according to a company statement published Tuesday. The $115 million park will have 27 towers and an installed capacity of 54 megawatts. It will deliver 52 megawatts to Mongolia's electrical grid, Oliver Schnorr, director of Sainshand Wind Park LLC, said in a text message. Mongolia is seeking to diversify its energy supplies, now heavily reliant on coal-fired power plants, with a goal of increasing its energy production from renewables to 20 percent by 2020. In 2013 Mongolia opened its first wind farm, a 50 megawatt facility at Salkhit, about 70 kilometers (44 miles) south of Ulaanbaatar. The site at Sainshand, located in Mongolia's Gobi Desert about 460 kilometers southeast of Ulaanbaatar, has one-year wind measurements of 7.4 meters per second, according to the statement. A bankable power purchase agreement for the park has been signed with the state-owned energy supplier, the National Power Transmission Grid Co., according to the statement from Ferrostaal, which is based in Essen, Germany. Engineering procurement and construction term sheets for the work on the park have also been signed. The financial close arranged by Ferrostaal Capital GmbH is expected "within the next few months," according to the statement, with financing by leading international development banks. "We go on 70 percent debt and 30 percent equity," Schnorr said. "The equity is majority from us." The company hasn't closed on debt finance, which may come from development banks such as the European Investment Bank and also Overseas Private Investment Corp. in the U.S., which are the "typical development banks that are looking for renewable energy financing." Ulaanbaatar, March 18 (MONTSAME) The "Golomt" commercial bank of Mongolia will cooperate with the "Magyar Trade House" LLC, a branch of the Hungarian National Trade Representative in Mongolia, in expanding the ties between Mongolian and Hungarian businessmen. A contract was signed Wednesday by L.Bolormaa, first deputy director of the "Golomt" bank on investment affairs, and by Rizak Sandor, general director of the "Magyar Trade House" LLC. The sides intend to boost the business ties, to support ongoing projects and programmes, to share information, and to provide each other with financial and consulting services. March 18 -- We are pleased to announce that Ard Capital Group ("ARD") will now be looking after the CPS Capital Group Pty Ltd ("CPS") client base in Mongolia – effective immediately. ARD has been named as the "Top brokerage company 2011" by the Mongolian Securities Dealers Association, the sole self-regulatory professional union in Mongolia, and received the "GRAND BULL AWARDS – BEST INNOVATOR 2013", the highest award of Mongolian capital market. Please note: Per your original account opening documentation, which we can supply upon request, all trades and associated fees and charges MUST be paid for. CPS has the right, retains and reserves that right to sell a portion of a client's position/ holdings out to cover an account should there be a shortfall. Ch.Tsogtbayar: Why not Mongolian brand? March 18 (gogo.mn) We interviewed young man, Ch.Tsogtbayar, exemplary young generation of Mongolia. He is the founder of Choi Hainzan brand, which produced the first Mongolian wireless headphone, smart bracelets and watch with positioning system. He purposed to produce affordable yet quality product with Mongol mind and he has accomplished his goal with cooperation of his friends and partners. First of all, congratulations to you. You are ready to deliver your products, which reflect your heart, to the customers. Thank you. The store is officially not open yet. However, people interested in our products are coming. I am excited to hear praise from the customers who visited the store. The official opening of the store was scheduled this week. But my partners were busy, official opening is planned for the next week. People are very pleased to hear that Mongolians are producing smart devices. Where did you get the origin of Choi Hainzan brand? I had always wanted of being a manufacturer and I thought why can`t we do everything. I have tried to do variety of things. Then, I decided to produce affordable and quality product for the youth. I aimed to do something done by myself and I cooperated with my friends. Generally, my products are dedicated to young generation. Why people must buy expensive branded products? We are offering affordable prices with same quality as expensive brands, and we can say that is our advantage. Our principle is quality, therefore users must have same experience as expensive brand too, or maybe even more functionality. Lately, fashion has become a contributing item in development of Mongolian content. Thus, we initiated equipment for youth. What challenges did you face during the initiation and operation of new business? How did you cope with the challenges? Initiating brand new thing is difficult and people tend to think that something new is actually something old that is improved. Thus, we conducted survey on new products or at least one part of product that can be produced in Mongolia. Everybody knows that support for production of technology products in Mongolia is not developed yet and the condition is hard. Therefore, we faced two issue, to produce high cost product in Mongolian market or whether to co-brand from abroad. 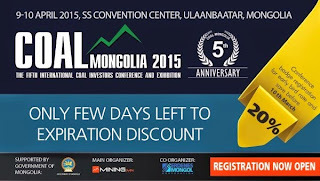 How to develop business environment in Mongolia? As we see, business environment in Mongolia should retain the value internally by changing the tax policy on products as well as food items that we are able to produce and manufacture in Mongolia. In addition, there should be limit in profits margin at stores that resell products. For instance: we offer affordable price to customer, but retail stores add 20-30 percent of margin, as a result, customer is pushed to buy expensive products. I recall that you have had an idea on your mind for a while and the achievement of idea have taken long time. How much time was spent to finish your products? Production of these three products took a year. In addition to the product, we worked on logos, brochures and package, which involved more people and labor. In reality, production was not easy at all. Cost of producing one small metal lock of watch was too high. For production, there is no legal support in Mongolia. What was your impression when you received the product? We had been seeing our products as picture. Then, when we received the product I felt little disappointment. We had been improving our products and worked on every mistake or something we didn`t like. Finally, we have realized that the products become more realistic with its package and brochure. Are you facing problems with promoting your product to the market? Of course, everything meets difficulties. We are mainly focusing on marketing and sales. Customers are mostly satisfied with our products. Some customers have wrong idea due to lack of information on our products. We are working to deliver affordable products to Mongolian customers. Tell me about your brand name? Choi is my father`s name and Hainzan was my grandfather. Alone they were read like Korean or German name, then I combined them together. What about the motto? Before, it was "For Beautiful People" and it has changed now. I think that motto should be unique. Before, it was "For Beautiful People". Now it changed to "For Youth". Previous motto was designed with mind that to every parent their children are beautiful and precious. But we decided to change as our target market is youth. Chinggis square is described on the package of "Naiz" /Friend/ watch with positioning system? I didn`t want to use the old bitten up traditional pattern on design in order to include Mongolian content. I just aimed to create specific design for youth to suit to taste of the modern Mongolians. I graduated from 24th elementary school. Then, I earned Bachelor Degree in Software Engineering at Computer Science and Management School of Mongolian University of Science and Technology. After, I graduated from University of Finance and Economy majoring in Business Administration. Did you create your application by yourself? Writing code does not make one a software engineer and it takes long time. Thus, I hired one of the best software engineers. It takes too much time when one person attends to everything. Therefore, I think, together we can do more powerful and nicer things. Better management helps us to create more powerful and realistic things. Because of going to bed late, I tend to sleep in the morning. But I wake up at 07.50am everyday. You might have full schedule everyday as you are employed and operating business as your hobby? Indeed, I rarely have free time. I work for Uniltel Group as Sales Manager. I spend most of the day at my job. Moreover, I go to gym and planning to attend bodybuilding competition. I have many things to do including plan for next step and some other stuff. Your brand is your hobby. What do you usually do if you have free time except of your hobby? I have no free time at all. If I have free time, I prefer to stay home and rest. Thank you for accepting our invitation. Let's finish the interview with the last question. When will you introduce your next product? The next product is scheduled to be introduced in May. March 17 (Khan Bank) Khan Bank organized a special program throughout the country with the purpose of intensifying financial education of school children on the occasion of Global Money Week, which is taking place from 10th to 17th March 2015. Engaging school children and young people who are the country's future, in learning about financial education and financial awareness from an early age is beneficial for increasing their contributions to the country's development. For this reason, Khan Bank implemented the program on providing school children with financial education under the theme "ONE BRANCH–ONE SCHOOL" within the framework of Global Money Week. Khan Bank's employees of all branches across the nation taught the complex lessons of financial education under the subject "Money, Spending Money Wisely, Creating Savings and Banking Operation" to over 42,000 students from high schools of the Ulaanbaatar's nine districts and 21 aimags in interesting and interactive ways. Such voluntary endeavor by Khan Bank's employees together throughout the country is of great to school children, increasing their financial education and awareness. The teachers, students and their parents are very thankful for teaching the value of money; accurate spending of money and importance of savings to children and youths, and this is evidence that the lesson has reached its targeted segment. As for fulfilling its corporate social responsibility, Khan Bank implements various of projects and programs aimed at making concrete contributions to the education of young people through the Khan Bank Foundation and declares one to two working days a year as Volunteering Day, which is dedicated to good cause to benefit the society and communities. In the scope of this program, Khan Bank has become experienced over the last three years in delivering information on healthy lifestyles, healthy eating and improving physical activity to over 55,000 school children and 13,600 individuals and traders throughout the country. Thus, Khan Bank has become a leading example in society through organizing such programs as providing school children with financial education across the country. March 18 (gogo.mn) This year Ulaanbaatar city plans to plant trees and plants in 92 streets and parks. The budget for green area is projected at MNT 5.8 billion. Shaping of aspen trees started from march 19th, April 1st watering will start and prepare the soil for the grass and April 10th will start the planting of the bushes and plant fences. Over 500 thousand bushes are planned to be planted in the city streets this year. April 20th will be the start of the whitewash for trees and soil disinfection will start on May 1st. While grass will be planted on June 1st and flowers will be planted starting June 5th. Grass will be planted on the area covering over 300 thousand sq.m while over 400 thousand flowers will be planted. Elimination of the weed will proceed starting June 15th to August 15th. March 18 (AFP) Clad in a fox fur hat and dog hair boots, Mongolian merchant Undrakhiin Batulzii says his compatriots have over centuries mastered the art of beating the brutal winters of the steppes. Ulan Bator is regarded as the world's coldest national capital and can see bone-chilling winter lows of minus 40 degrees Celsius, tough even for the hardy descendants of Genghis Khan. For a newcomer the temperatures can be achingly uncomfortable, especially if stationary. Exposed ears and hands quickly begin to hurt, while standing on frigid concrete overcomes extremities not shod in properly insulated footwear. "Staying warm is worth 1,000 lan of gold," goes one Mongolian saying, placing a monetary value on avoiding the cold -- with one lan weighing 37 grams, it is the equivalent of $1.4 million. But Mongolians cope by means of fancy fur hats, hot food and drink, stoic good humour and layers of clothing -- "There are no fashionable people in winter," goes another saying. "Mongolians' ancestors were nomads," said Batulzii at his traditional garment stall in Ulan Bator's outdoor Naran Tuul market. "Everything we eat and wear is designed to overcome the difficulties of the four seasons," he added. "That's why Mongolians can beat the winter with no trouble." Ulan Bator lies at a surprisingly benign latitude south of Paris, but is 1,300 kilometres (800 miles) inland, far from the moderating influence of the oceans, and at an altitude of 1,350 metres (4,430 feet). Known as the land of the "Eternal Blue Sky", high pressures from Siberia give Mongolia cloudless winter nights that allow daytime land warming to escape to the atmosphere, and send temperatures plunging. According to World Meteorological Organization 30-year figures, Ulan Bator's average annual temperature is -2.4 degrees C (28 F), well below the 2.7 C of Kazakhstan's Astana, Reykjavik in Iceland at 4.4 C and Moscow, which enjoys a comparatively balmy 5.0 C.
Byambaagiin Yanjmaa, a retired kindergarten cook, credits traditional food and drink as key for getting through the coldest months. "Horse and lamb are very good for surviving the winter. Sheep find the best grass from the pastureland," she said in one of Ulan Bator's "ger" districts, largely poor, hard-scrabble areas where many homes are collapsible, felt-covered herders' dwellings. "It's not so bad," said the 69-year-old. "Everyone can adapt to it based on his or her strength and weakness." Nearby, workers broke up jet black raw coal into pieces to sell as heating fuel, a key contributor to the city's dire pollution levels. In Tov province west of the capital, herder Tumursukhiin Altanzaya tends her horses, cows, sheep and goats, including milking the bovines, all out in the cold, but said her lambskin deel -- a long Mongolian tunic -- and wool boots help keep her warm. "I ride a horse, and herd animals," she said. "When I get back home from the pasture, I drink aarts and eat khuushuur" -- a hot sour curd beverage and meat dumplings. Mongolia is periodically hit by deadly winters known as zud, marked by heavy snow and cold so severe that livestock are unable to graze, lose strength and freeze to death on the open steppe, sometimes destroying herder livelihoods. Millions of livestock died in the last one in 2010. About 1.3 million people live in Ulan Bator -- more than 40 percent of Mongolia's population. The lowest temperature recorded in the city so far this year was -34 Celsius on January 26, according to weather information service Weather Underground, but residents said the winter has been relatively mild. "This year it's surprisingly warm," said Begziin Dalai, a spry 86-year-old retired driver and father of eight, warming a bare hand over a meat-hawker's open fire on a sunny but sub-zero afternoon. Clyde Goulden, curator emeritus of the Academy of Natural Sciences of Drexel University in the United States, who researches Mongolia's climate, lists the country's plateau location and large open expanses as among factors that make it cold. Still, Mongolia's average temperature has warmed more than two degrees Celsius, or almost four degrees Fahrenheit, over the past 40-50 years, he said, citing studies. The average world increase is about one degree Celsius, he told AFP, but the trend for Arctic and nearby regions is higher. "It's just highly variable," he said. "More and more now the herders say the weather is changing so quickly that they can no longer predict what the next winter will be like." Damdinii Norjmaa, 84, lives in a small ger in Ulan Bator but still pines for the pastures where she once herded cattle. "I think winter is good," she said. "Because winter makes us much stronger." March 18 (infomongolia.com) Mongolian Parliamentary delegates headed by Speaker of the State Great Khural (Parliament) Zandaakhuu ENKHBOLD are conducting an official visit to the Federal Republic of Germany on March 14-18, 2015. On March 17, Speaker Z.Enkhbold was received by the invitee, President of the Bundestag, Professor Norbert Lammert and during the meeting, Prof. N.Lammert underlined, "The visit being conducted is an impetus effort to boost the bilateral partnership. Meanwhile, Mongolia's participation as the Partner Country at the ITB Berlin 2015 was significant to forward cooperation between the two countries. My first ever visit to Mongolia was about 10 years ago and the developing partnership is also a fact of mutual growing number of inter-parliamentary visits". In turn, Speaker Z.Enkhbold affirmed that the reciprocal visits have been normalized that cause and play an important role to develop inter-parliamentary relations, and further noted, "Mongolia hosts the Parliamentary Assembly of the Organization for Security and Co-operation in Europe (OSCE PA) in Ulaanbaatar in September 2015 as well as prepares for the 11th Asia-Europe Meeting (ASEM) Summit in Mongolia. Also, upon the request of German side, Mongolian military servicemen are jointly participating in the second stage of "Resolute Support" mission in Afghanistan. As of economic collaboration, Mongolia and Germany have inked an intergovernmental document on mineral resources, which is undertaking and progressing today. Although, the coal-liquidation project negotiated has been halted and therefore, parties should focus on this project to move forward. Nevertheless, the joint project on establishing the German-Mongolian Institute for Resources and Technology has been successfully accomplished". Following the meeting with the Bundestag President N.Lammert, Speaker Z.Enkhbold and accompanying delegation were invited to get acquainted with the Reichstag building. On the same day earlier, Parliamentary State Secretary to the Federal Minister for Economic Cooperation and Development Mr. Hans-Joachim Fuchtel called a courtesy call on the Speaker of Mongolian Parliament Z.Enkhbold. Also, Speaker of the State Great Khural delivered a lecture on "The value of Mongolia's Democratic Revolution in 1990, its development experiences, lessons and future perspectives" at the Konrad Adenauer Foundation, where opening remarks were presented by Deputy Secretary General of the Konrad Adenauer Foundation Dr. Gerhard Wahlers and the Chairman of Thuringian Committee of the CDU/CSU and German-Central Asian parliamentary groups in the Bundestag, Mr. Manfred Grund. On March 18-21, 2015, Mongolian Parliamentary delegates will be continuing their official visit to the Republic of Poland upon an invitation of the Marshal of the Senate, Bogdan Borusewicz. March 18 (Ministry of Foreign Affairs of Belarus) On March 18, 2015 Ambassador Extraordinary and Plenipotentiary of the Republic of Belarus to Mongolia Stanislav Chepurnoy met with the Minister for Mining of Mongolia Rentsendoo Jigjid. The sides discussed diversification of supplies of machinery from Belarus, possibilities of employing Belarusian experts and utilizing applicable technologies in Mongolian mining as well as establishment of joint Belarusian-Mongolian venture in this field. March 18 (gogo.mn) "Northeast Asian Energy Security Forum" has been organized by the initiation of Mongolia for two years with the attendance of six countries located in Northeast Asia. This year, the Ministry of Foreign Affairs hosted the "Northeast Asian Energy Security Forum 2015" and two day forum was ended today. Participants of the forum included not only representatives from Northeast Asian countries, but also representatives from Asian Development Bank and International Energy Agency. Meeting outcome will be stated as the Ulaanbaatar Notice, which is being processed and to include the strategies of establishing trust among the countries in the region, developing of the economic relations based on the energy cooperation and vitalizing of the energy integration within the region. Parties have agreed to expand cooperation between energy research organizations and scientists. Moreover, the expert meetings will be organized regularly. During the forum, three panel sessions were held and over 20 reports were discussed. Scientist from Japan said: "We are facing lack of energy since Fukushima disaster. Thus, that forum is important for us." Energy is the main subject of economy, politics and security. Therefore, participants of the meeting were appreciated to the importance of the forum. March 18 (news.mn) Member of Parliament and Minister of Mongolia U.Khurelsukh, who is participating in the third UN World Conference on Disaster Risk Reduction, has met with Vladimir Endreevich Puchkov, Russia's Minister of Emergency Situations to discuss cooperation at the border. In 1995, Mongolia signed an agreement on intergovernmental cooperation between Russia and Mongolia in protection from industrial accidents and natural disaster, and in the field of eliminating the risk of disaster. Intergovernmental commission meetings have since been held 13 times, and regional meetings are now held twice a year. During the official visit of President of Russia Vladimir to Mongolia last year, an intergovernmental agreement to protect forests from fires was also signed. Minister Puchkov has invited Minister U.Khurelsukh to participate in the joint exercises of Russian and Mongolian emergency rescue teams to be held in May in Moscow. Minister U.Khurelsukh stressed, "It is time to lead the next stage of agreements which have been concluded. Let's cooperate in the field of protection from disaster. Work in the field of emergency response and prevention is the work of brave-hearted people. A Motherland sits in the hands of brave-hearted people." March 18 (infomongolia.com) Today on March 18th, Mongolia celebrates the 94th Anniversary of founding of contemporary Mongolia's Army, when on this day a guerrilla army led by Commander-in-Chief of the Mongolian People's Partisans Damdin SUKHBAATAR liberated the Mongolian part of Khiagt (Kyakhta) from the Chinese troops and had been observed as the Day of Mongolian Armed Forces as a public commemorative day since 2003 and renamed as the Mongolian Soldier's Day since 2011. Welcoming the Day, representatives from the Defense Ministry of Mongolia and General Staff of Mongolian Armed Forces as well as former and incumbent generals, colonels and other officers have laid wreathes to the Monument of D.Sukhbaatar on March 17, 2015. In his remarks, Defense Minister Ts.Tsolmon emphasized, "Mongolia commemorates many victorious events from Chinggis Khaan's successful founding of the Mongol Empire, further, Independence Movement, People's Revolution, Battles at the Khalkh River in 1939 and Liberation War in 1945. Now, Mongolian military servicemen have been successfully fulfilling their duties in peacekeeping operations in hot spots to promote the reputation of Mongolian Soldier". On March 18, 2015, President of Mongolia Ts.Elbegdorj issued an Executive Decree to reward the Chairman of General Authority for Border Protection, Brigadier General Sh.Lkhachinjav with Major General, and the Brigadier General rank was awarded the Chief Inspector of Mongolian Armed Forces, Colonel P.Dorjsuren; Chairman of National Emergency Management Agency, Colonel T.Badral, and the Deputy Chairman of General Intelligence Agency, Colonel S.Erdene respectively. Moreover, celebrating the day, members of Legal Standing Committee of the State Great Khural (Parliament) and female parliamentarians showed tribute to five female peacekeepers participated in Sudan, South Sudan, Sierra Leon and Afghanistan. March 18 (infomongolia.com) In recent years, Governing Administrations of the Capital City and Bayan-Ulgii Aimag have been actively discussing to launch a Tsagaannuur (Tsagaan Nuur) Free Trade Zone in the territory of Tsagaannuur Sum of Bayan-Ulgii Aimag. Few days ago, some business representatives from Russia and China interested to invest in this big-scale project have gathered in Ulgii Sum of the Aimag and now working in Ulaanbaatar to exchange views with affiliated authorities from the Ministry of Industry. In conjunction, welcoming the Kazakh people traditional spring festival Nauryz (Nauruz, Nowruz), the Tsagaannuur Auto Port will be temporarily closed on March 18, 21, 22 & 23, 2015, announces the Immigration Office. The Tsagaannuur Auto Port borders with Tashanta Port of the Altai Republic, Russia and locates 4.5 km away from Mongolia-Russia Border and 100 km from center of Bayan-Ulgii Aimag, and about 1,900 km from Ulaanbaatar, capital city of Mongolia. March 18 (gogo.mn) Natural History Museum has been closed in June 2013 due to the expiration of its building and the exhibits are being relocated. It has been two years since the closure of the museum and we met with Director N.Zorigtbaatar to clarify on the dates of its reopening. -Have the exhibits been all relocated? -Our museum has dedicated fund for storing the exhibits and by the end of 2014 we have done the relocation of all the exhibits. The extension of the museum built in 1989 is now being use as fund for exhibits and the duration of the building is 50-60 years. Relocation of the exhibits was done in accordance with the protocol and have been placed in packages. -Have the layouts for the new museum building done yet? -Building layout prints have been done during the previous Ministry of Culture, Sports and Tourism. It is projected to be 7 floor, 15,500 sq.m building, three times bigger than the current one. Drawings have been done by Baldan-C company. Financing of the project is estimated at MNT 24 billion. We have submitted the layouts and project documents to the Ministry of Education, Culture and Science. Also we have ensured the permission documents from the sewere, electricity and heating authorities. -New building is projected at the current location. When the current building to be demolished? -There are no conflicts on the land of the construction. Former Ministry of Culture, Sports and Tourism has been working on the funding of the project and submitted MNT 15 billion to be included into the state budget, unfortunately then Ministry of Economic Development rejected the proposal of funding. New building will feature central laboratory to prepare exhibits to be sent to museums in 21 aimags, 4D cinema, conference hall to accommodate 250 people. Paleontological exhibits are estimated to be displayed on 10 percent of the total space. -Once the financing of the project has been rejected in the 2015 State Budget, does it mean that the project is not going to proceed until next year? -We have been submitting requests to Minister L.Gantumur since January on two main aspects. First is, to include the financing of the project in the State Budget for 2016 and secondly, resolve the project implementation with the concession agreement. Ministry specialists have agreed that the concession agreement is the most appropriate approach for the project implementation and the inter-ministerial discussions are being held, then the issue to be submitted to the cabinet discussion. -When do you see the new museum might open its doors to the visitors? -If the financing wasn't rejected in the budget of 2015 we were able to demolish the current building within this year and start the construction works in 2016. If we succeed to have funds to be included in budget of 2016 new museum can be opened by the end of 2018. -What are the employees planning to do during the hiatus? -As long as the new building space will be three times as big there is need to increase the number of exhibits as well. Our advantage is we are doing research nationwide. Our researchers are doing the studies on increasing the exhibits and other employees are being trained in Russia for the new skills. March 18 (infomongolia.com) The second leg match between Mongolia and Timor-Leste in the Asian preliminary first-round for 2018 FIFA World Cup was hosted in Ulaanbaatar on March 17, 2015. To recall, the first leg between Mongolia and Timor-Leste was held in Dili, where the host nation won over Mongolia by 4:1. However it was pretty much expected that Mongolians would show advanced game on their soil, but unfortunately the match finished in favor of the guest players by 1:0 (Patrick Fabiano at 9'). Consequently, Timor-Leste a step closer to 2018 FIFA World Cup Russia winning over Mongolia by 5:1 on aggregate after regular time. In the Asian preliminary first-round, six pairs are playing in Pot A (India- ranked 173rd, Yemen-175th, Timor-Leste-185th, Cambodia-181st, Chinese Taipei-188th and Sri Lanka-174th) and in Pot B (Nepal-180th, Pakistan-170th, Mongolia-195th, Macau-187th, Brunei-198th and Bhutan-209th), by FIFA Men's Ranking as of March 12, 2015. Moreover, Pakistan's home leg against Yemen in Lahore was postponed and shifted to an unconfirmed neutral venue after a Taliban attack on churches in the city.